Pakistan were reeling on 57-5 part way through the morning session, their top order decimated by Lyon (4-78) in the space of six deliveries as he took four wickets for no runs. 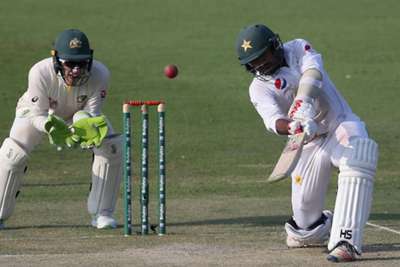 The efforts of the batsmen were rewarded as Australia made a poor start of their own at the crease, Mohammad Abbas (2-9) taking two early wickets to leave Tim Paine's side on 20-2, trailing by 262. Lyon fell short of the treble, but his next over – following Jon Holland's maiden – was just as rewarding, with Labuschagne catching from Asad Shafiq before Babar Azam's stumps were ripped out.